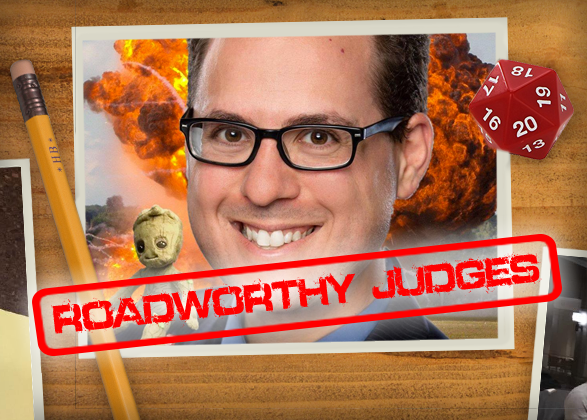 Home » Latest News » Roadworthy: Judge James Walls! You might remember Judge Evie, who just happens to be the daughter of this week’s roadworthy recipient! He’s quite the notable Judge in his own right, and has left many fans in his wake. Let’s all welcome Judge James Walls! My name is James Walls (aka Judge James from Glowburn), and I live in Glen Mills, Pennsylvania, just outside of Philadelphia. Up until June I had lived in the Pittsburgh area. I consider myself to be a gaming evangelist. 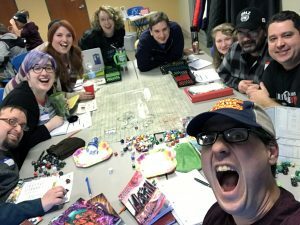 It is my personal mission in life to introduce as many people as possible to role-playing games, and return all those who have left our wonderful hobby back to the fold. My judging style is a healthy blend of over-the-top improv, combined with copious heaps of pop culture references. I love to make my players laugh, and enjoy nothing more than watching gamers walk away from my table with gigantic grins on their faces. I first heard of DCC on the Role Play DNA podcast back in 2014. The crew recorded an actual play of a 0-level funnel. I had never heard of the concept, but it sounded intriguing. Maybe something fun for a one-shot. Fast forward four years, and I’d say that 95% of my RPG’ing is either Dungeon Crawl Classics or Mutant Crawl Classics. I have multiple campaigns cooking, one of which is over 2.5 years old. My current tally is 9 sessions. This has been a crazy year from our family. I got a big promotion and we relocated to the Philadelphia area. So I’m lagging behind last year’s tally a bit, but I hope to catch up. I’ve got 3 more sessions planned at our FLGS through the end of the year, and I’ll be running events at both Save Against Fear in October and PAX Unplugged in November. This is such an evil question! 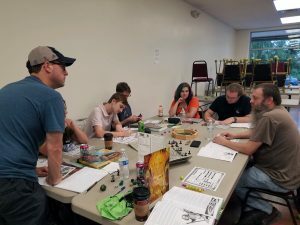 I’m going to go with our event this past June at Free RPG Day. Our family had just moved to the Philly area a couple days before, and I signed three of us up to play at the Games Keep in West Chester, PA. I was so, so nervous! See, back in Pittsburgh, I ran games alongside the amazing Michael Bolam at a store that I had been shopping at for over fifteen years! There was already a very strong DCC presence in Pittsburgh. Running games there felt like home. I ran Forrest Aguirre’s Beyond the Silver Scream for Carrie, Evie… and five people I hadn’t met in person before. I’m pretty sure it was the store’s first DCC Road Crew event as well. We had such a great time! Five of the players had never even tried DCC, and they all walked away hungry for more. More importantly, I gained five new friends. This event was just further proof that if you are a gamer, you are never alone. There’s always a table waiting for you somewhere. Now that I’m back in the Philadelphia area I run monthly games at The Games Keep in West Chester, PA. Back home in Pittsburgh I ran games at two awesome venues: with the Norwin Game Knights in North Huntingdon, PA or at Phantom of the Attic in Oakland. Make sure everyone at your table is having a good time. Coach players new to the system. Bring plenty of swag, extra dice, extra pencils, and extra character sheets. Always be prepared to add at least one more player. If playing at a friendly local game store, please make sure to purchase something, and encourage your players to do so as well. Finally, as Road Crew judges we are representatives of DCC, MCC, and most importantly, Goodman Games. Be courteous, polite, respectful, and engaging, not only with your players, but with other people at the venue. What is your most hard-core DCC moment, in or out of a game? Way back in October, 2016, when I co-GM’d David Baity’s Carnival of the Damned alongside my much-more-famous daughter (and Order of Shanna member), Judge Evie. 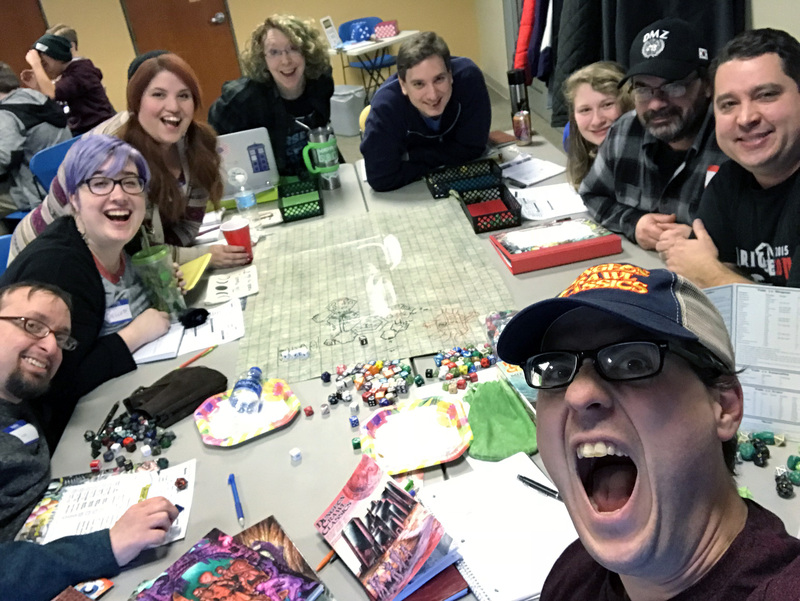 The two of us ran thirteen players through the dreaded clown-pocalypse adventure as a special Halloween tournament funnel event for the Norwin Game Knights. We had all kinds of props and stickers and prizes. 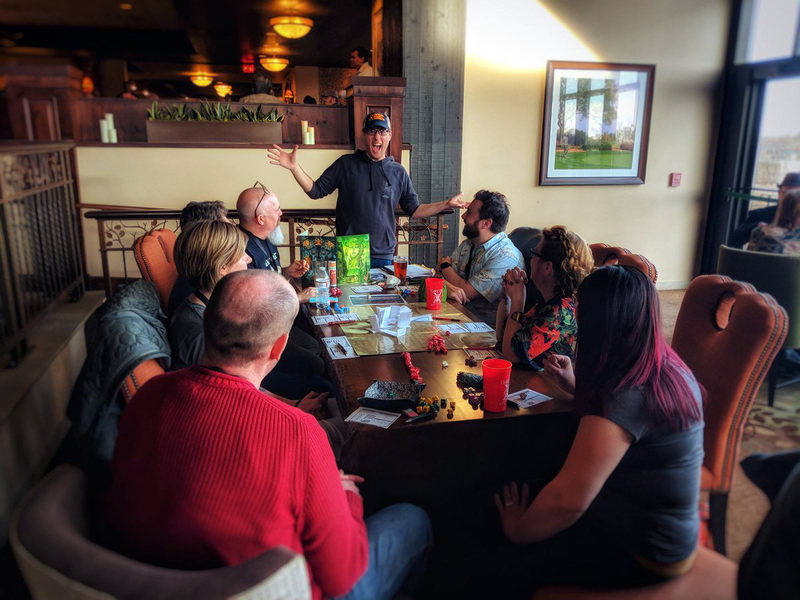 More importantly, our game became the focus of most of the club, as they all circled our table, watching the carnage as if it were some kind of sports spectacle. Definitely a turning point for my daughter, as this game helped fuel her desire to run games herself.